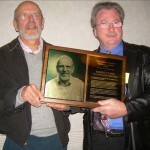 January 21, 2010 – The California Citrus Quality Council is pleased to announce that Robert F. Luck, a Professor of Entomology at the University of Riverside, is this year’s recipient of the California Citrus Quality Council’s prestigious Albert G. Salter Memorial Award in recognition of his enthusiastic and innovative applied research in the field of citrus entomology. Over the past several decades, Luck provided laboratory and field research that enabled citrus growers throughout California to effectively incorporate integrated pest management practices into their growing operations, resulting in a reduction in the use of pesticides while maintaining acceptable levels of economic pest control. Luck is a leading expert in the research of armored and unarmored scale insect control using biological methods. He began his work in entomology through his interest in forestry. At UCR, he has devoted much of his time and research to the study of Aphytis melinus, a parasitoid for the biological control of the citrus red scale. His contributions to the citrus industry have earned him the gratitude of all California citrus growers.